This review has everything to do with a bit of history. Not just history, perhaps one of the change makers in aviation. It has everything to do with the Douglas Aircraft Company DC-8. 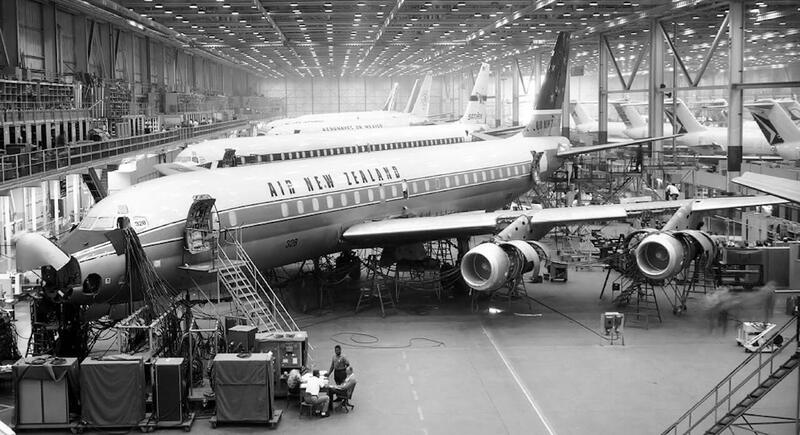 This historical snapshot from Boeing Commercial reveals the following; The DC-8 was the first Douglas jet-powered transport. It entered service simultaneously with United Airlines and Delta Air Lines on Sept. 18, 1959. Powered by four jet turbine engines, the DC-8 was capable of speeds of more than 600 mph (966 km/h). In a test dive, it became the first commercial transport of any kind to break the sound barrier. Throughout its 14-year-long production run, the DC-8 went through seven major variants, for a total of 556 aircraft. The basic domestic version, the DC-8 Series 10, had increased fuel capacity for intercontinental flights, and the Series 30 and 40 were the first to use the 17,500-pound-thrust (7938-kilogram-thrust) turbojet engines. The DC-8 Series 50 were the first DC-8s powered by new, more efficient turbofan jet engines with 18,000 pounds (8165 kilogram) thrust and longer range. The Series 50 were also the first to be offered customers in the convertible passenger-freight version or the windowless all-freight version. 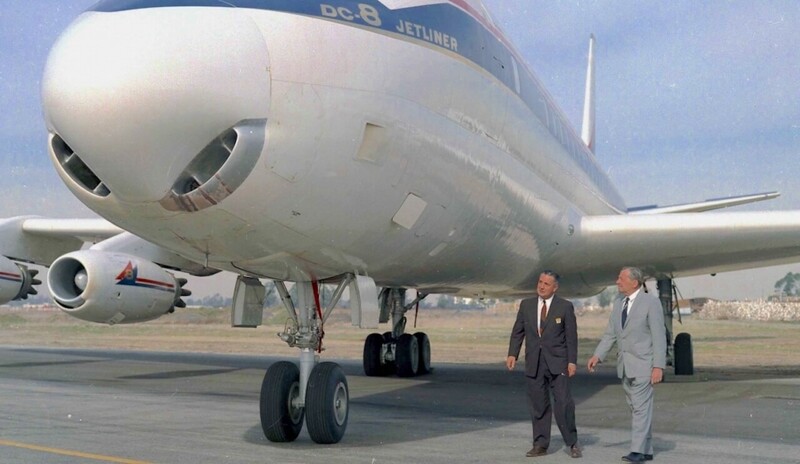 The DC-8 Series 60 extended the length of the fuselage. Nearly 37 feet (11 meters) longer than the original model, in an all-economy passenger configuration, the DC-8-61 could carry 259 people. Its convertible-freighter configuration had a cargo volume of 12,535 cubic feet (3820 cubic meters). The DC-8-62, for extra-long routes, had a fuselage stretched 6 feet 8 inches (2 meters) longer than the original model and 3-foot (91-centimeter) wingtip extensions. All design improvements of the DC-8-61 and -62 were incorporated in the DC-8-63. The -63 could fly more than 4,500 miles (7242 kilometers) nonstop, carrying 259 passengers because of its extended fuselage; aerodynamic improvements to nacelles, pylons and flaps; and increased wingspan and fuel capacity. The DC-8 Series 70 was a re-engined version of the popular Super 60 Series, substituting CFM56 engines for the latter’s Pratt & Whitney engines. The result was an aircraft that retained the Super 60 operating weights but with a longer range due to the newer, more fuel-efficient turbofans. The Series 70 was also able to meet later, more stringent noise regulations that were implemented in the 1980s. When you want, you can read and view much more about this legendary aircraft at the dedicated Wikipedia web page. But for those who prefer old-fashioned YouTube movies, you must see these two movies – Douglas DC-8-63 Jetliner Promo Film – 1967 and the Douglas DC-8 Passenger Jet Promotional Film “Birth of a Jet”. X-Plane 10 or X-Plane 11? Lead developer Michael Wilson isn’t only responsible for modeling the Douglas DC-8 aircraft. 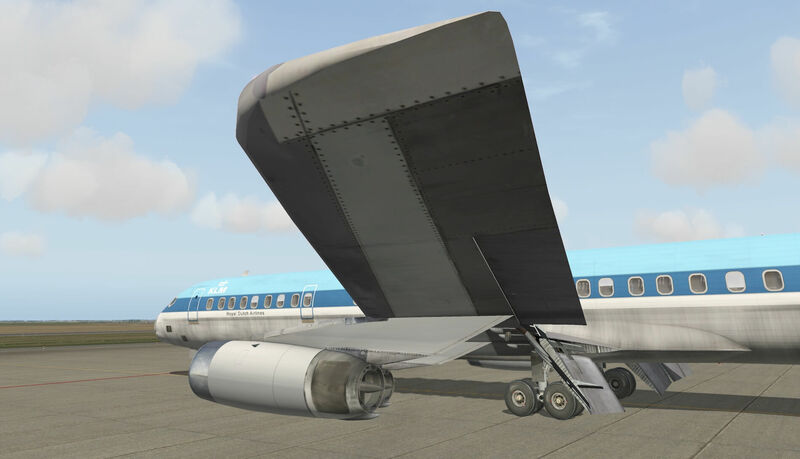 He also developed for both X-Plane 10 and X-Plane 11 the Boeing 707 Series and, only for X-Plane 10 as of this writing July 2017, the Lockheed L-1011 Tristar. Furthermore, for the same X-Plane platform, the Hawker Siddely Trident 1C and the Short Solent MK III. 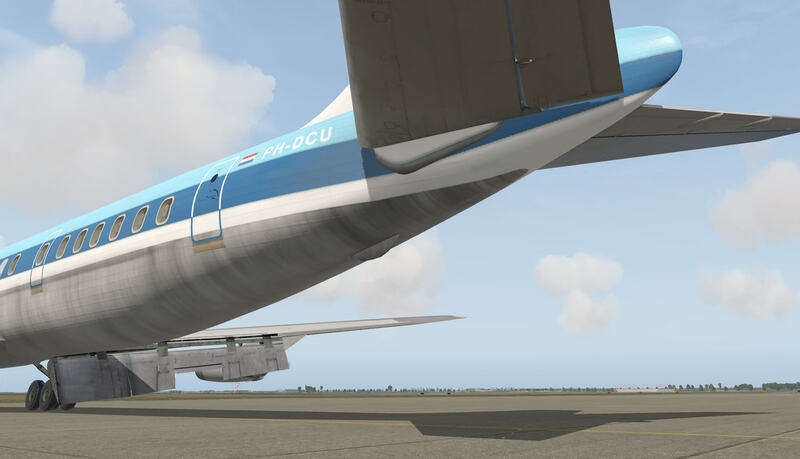 Perhaps you’ve got the idea already, this review has everything to do with the Douglas DC-8 Series for X-Plane 11. Why did I choose the DC-8 and not the Boeing 707 Series? 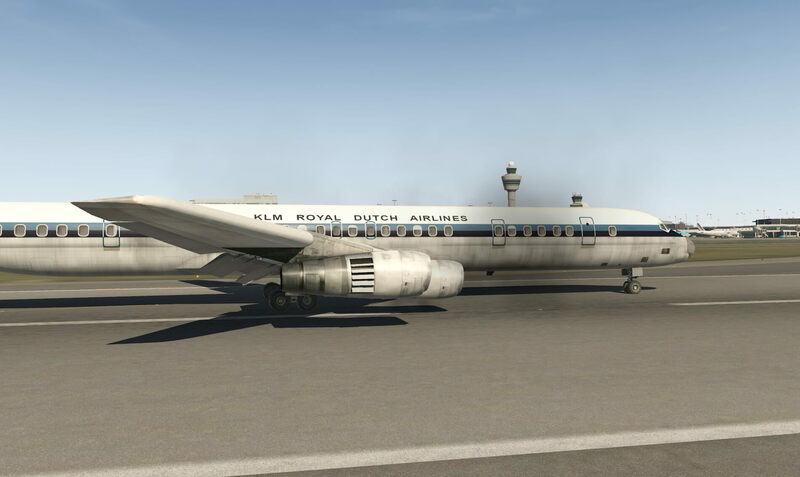 This has everything to do that during that time, I was working in the aviation as a apprentice mechanic and while I was working on the old-fashioned DC-9-30, I’ve seen at Schiphol Airport many Douglas DC-8 aircraft, in particular from the KLM and some other companies. 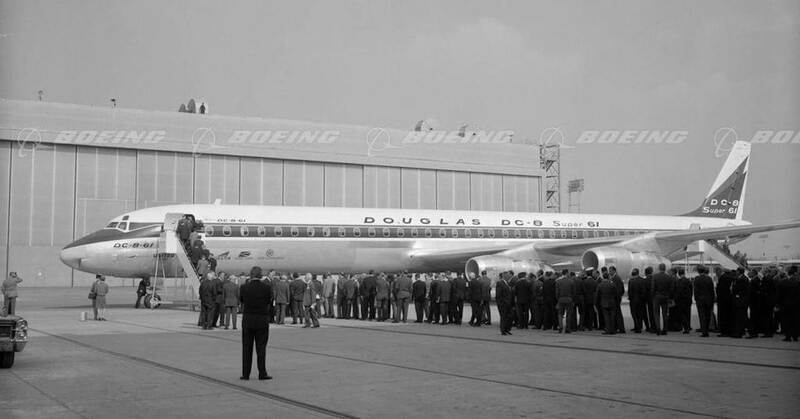 I was impressed by, for example, the length of the DC-8-63 – also included in the package – which was almost of the same size as the Douglas DC-10. During that time, I’ve seen more DC-8 aircraft then Boeing 707. That said, I’m curious how this aircraft looks like, how it flies although DC-8 flying experience I haven’t at all so hopefully YouTube movies can help me getting a better understanding how this bird flies. The fact that Michael Wilson his team decided to model this aircraft is already great news to me and for sure many other simmers. Perhaps it’s me, but I find the package name a bit confusing. At the dedicated X-Plane.Org page you can see that the package is named DC-8 71 XP11. 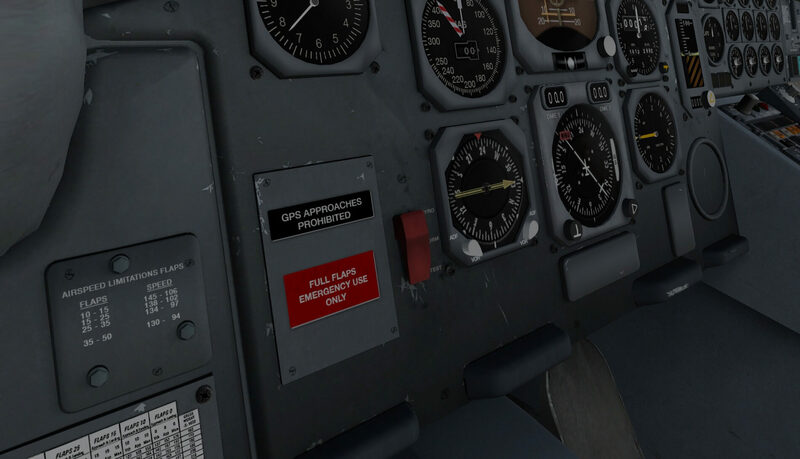 XP11 makes sense – only applicable for X-Plane 11, but the DC-8 71 suggests that it’s only the DC-8-71 series. Not an issue ……. as long as you keep it in mind. Besides those 4 models, you’ll also find a “manuals and Addons” folder. But more about this later. I would like to highlight right now a couple of things related to the navigation systems used in these modeled DC-8 aircraft. The real world was after all a mess. Although Douglas started with basically all DC-8’s having the same cockpit lay-out, it turned out after some time that each company had a different configuration. I did mention the navigation system thus DC-8’s could be equipped with no INS (Inertial Navigation System) at all, or the DC-8 was equipped with the Delco Carousel (developed by Delco Electronics) CIVA INS and finally, a modern FMS (Flight Management System) was installed. By the way …. the Delco Carousel derives its name from the fact that the inertial reference platform is in constant rotation as a technique to reduce drift and increase accuracy. Depending on the airliner, different AP’s could be installed, especially when airliners kept the DC-8’s in their fleet. You can find the “basic AP”. This means, there is no glareshield panel installed like we know from other modern aircraft like a MCP (Mode Control Panel) or AFS (Auto Flight System). Instead, the basic AP panel was mounted on the pedestal and wasn’t really sophisticated, but for those days it was a relieve for the pilots who flew this aircraft on long stretches. But there are also configurations with a kind of AP control panel on the glareshield and having the basic AP panel on the pedestal. When we’re talking about the modeled Auto Pilot, all Wilson Classical aircraft come with a glareshield situated AP panel. On the pedestal, just behind the throttles and fuel shutoff levers, there’s that basic AP panel I just talked about, however this isn’t functional. Back to the modeled and installed navigation. It depends on the type of DC-8. 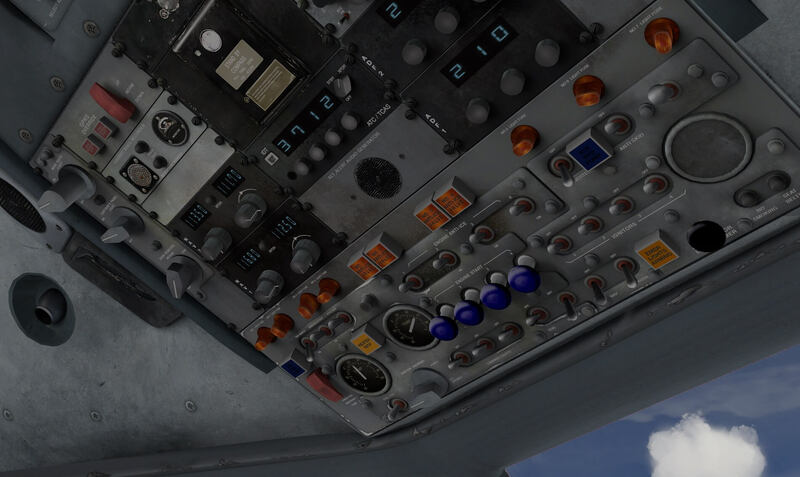 The -61 and -63 offers a CIVA INS which isn’t functional unless you buy the CIVA INS package via X-Plane.Org else you can use the default X-Plane 11 FMS CDU. Just to clarify it a bit more. On the left-hand side of the pedestal you’ll find the INS dummy, on the right-hand side the default FMS (M)CDU. 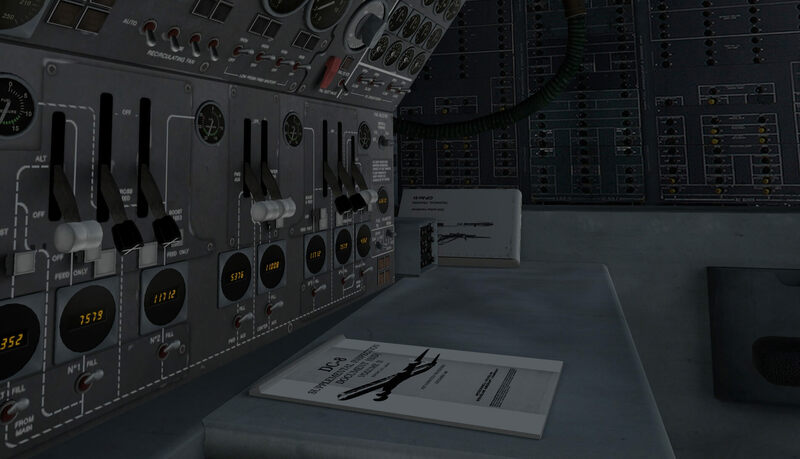 The DC-8-71 and -71F models only come with two default X-Plane 11 FMS (M)CDU’s installed. But first, a short interview I had with Michael Wilson. 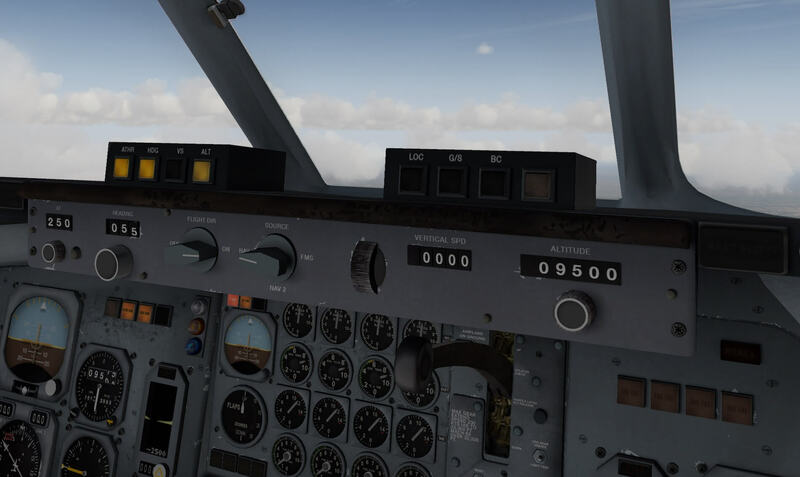 A small note is fair to highlight; team mate Julien has done all the DC-8 Series upgrade work of the models between the period 2016 / 2017 which includes building the 3D cockpit, and due to Julien, the package as it is now, not only includes the -71 series, but also the -61 and -63 models. Curious as I am, I decided to contact Michael and asked him if he likes me to do an interview to let the community know who Michael is, what he did before, what his relation is with X-Plane etc. That said, I send Michael a couple of questions and here is the outcome. Why the interest in old-fashioned/historical aircraft types (what I love by the way)? I was a kid in the 1970s and loved airplanes, and those were the kind of airplane types that were around then. Do you have a kind of “relation” with these historical aircraft? I’ve flown 2 or 3 times with the Caravelle, I sold the X-Plane Caravelle jet to Heinz/Nicolas. I’ve also flown on the 707 at least once. Related to the Douglas DC-8 model; any reason to go for the -61, -62 and -70 models? 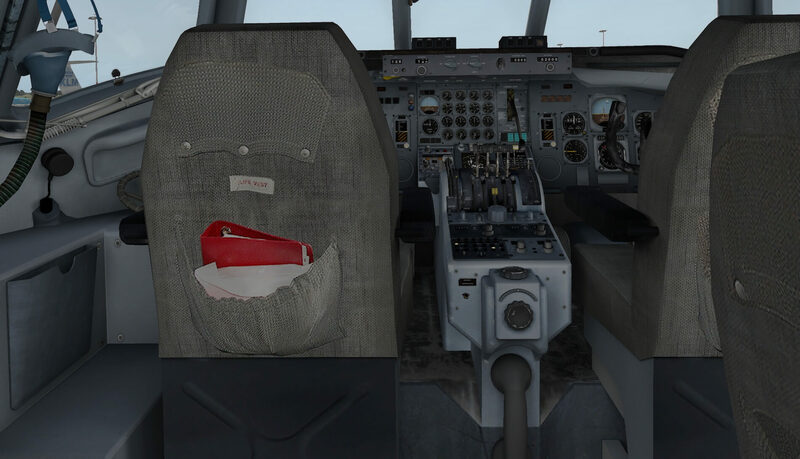 I need to stress that although I first published it in 2004, my team mate Julien has done all the upgrade work 2016 / 2017 which includes building the 3D cockpit, and it was Julien who wanted to do the other DC-8 versions. 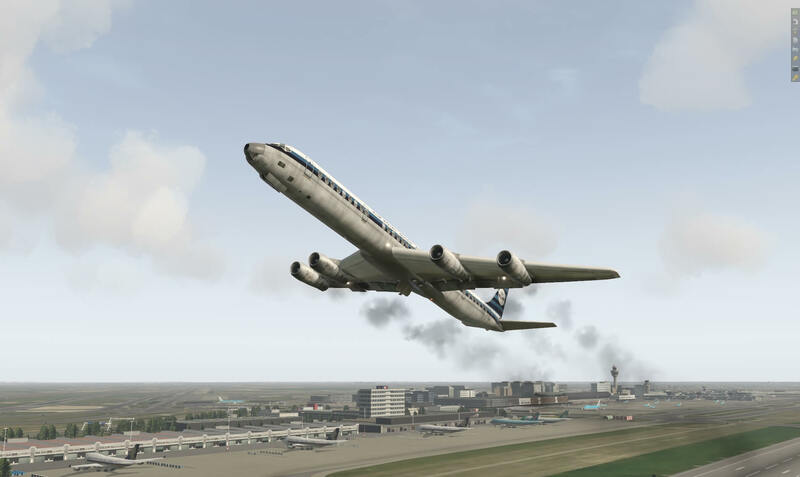 Incidentally my DC-8-71 was the first payware airliner in X-Plane history released March 29th, 2004. Is it possible to tell the XP community something more about your background, in particular the modelling, programming, or perhaps even real aviation experience? I have a PPL (Private Pilot License_ with 200+ plus hours in a Cessna 150/152. This helped me a lot designing my aircraft in Planemaker, and understanding aerodynamics. Also in 1996 from 1997 before desktop computer flight sims became impressive i won awards at IPMS meetings (international plastic model society) for scratch built and vacuform models. my 1/72 scale vacuform Myasishchev M-50 Bounder won model of the month award out of about 60 models at the San Jose meet, and then my 1/100 scale scratch built Breguet 763 won model of the month award out of about 60 models at the San Jose meet. Did you had the possibility, related to the Douglas DC-8, to photograph real models and if so, can you tell us a bit more about that? Julien photographed the DC-8-63 at the Paris Air and Space Museum (Musée de l’Air et de l’Espace! | Le Bourget). What was the overall impression of the retired pilots who tested and helped you with the DC-8 flight dynamics? They never had anything bad to say about the flight model. It would seem that if you get all the values right in Planemaker and Airfoilmaker, X-Plane usually simulates the plane correctly. 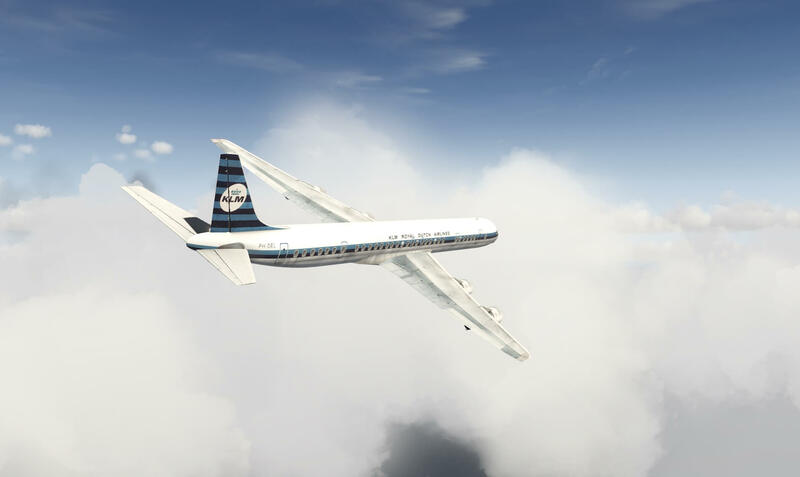 Will you release more liveries and if so, can you tell us which liveries for what DC-8 models? My guess is no, but here is the link for additional liveries customers have made. 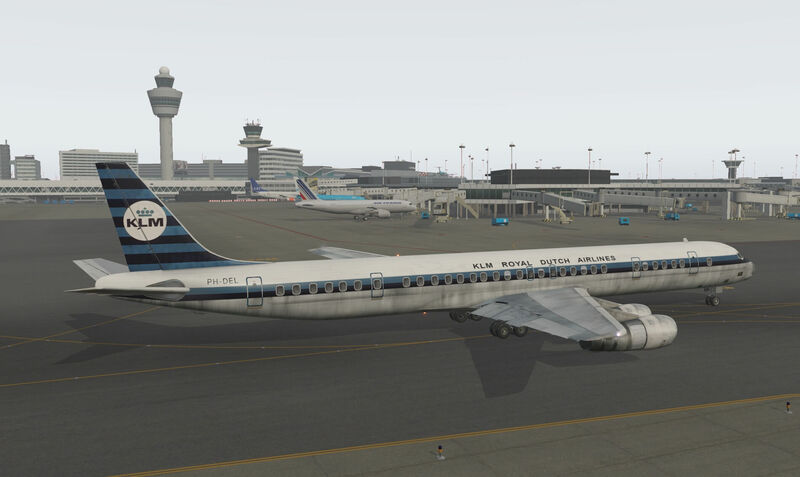 Worth to highlight is that all liveries that can be found via this link are also useable for the X-Plane 11 DC-8 Series. 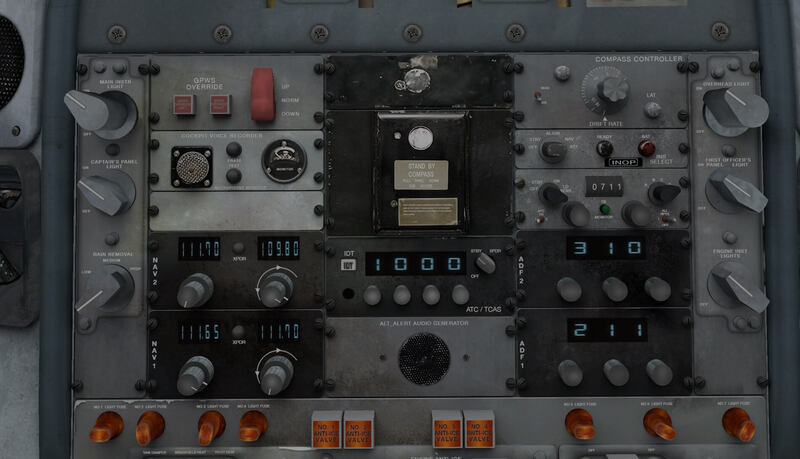 What was your profession before starting with these historical models and did you start from scratch with XP or did you program also for FSX/FS9? I started from scratch with X-Plane in 2001 because – lucky for me – Microsoft Flight Simulator didn’t work on my computer. If so (previous question confirmed), what was the reason to swap from FSX/FS9 to XP? Although I’m not FSX/FS9 minded, I tried Microsoft FSX out of curiosity back in 2009 and didn’t like how the graphics looked and the way the default planes handled. To me it did not seem realistic compared to my real-life experience. I just want to make it clear that by now Julien has done the bulk of the work on this plane. 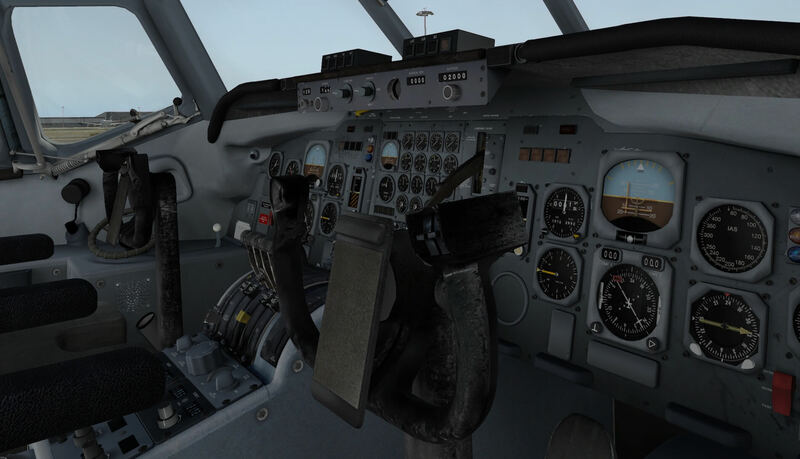 I see my contribution as the original author along with Gerhard Strack (2D panel) and the work that I did bearing the cyber bulling that came along with the publishing of this plane as well as the first payware planes in X-Plane starting from 2003. Perhaps worth to mention; I have written an article about this. Check this out! The Adobe Photoshop paintkit file format speaks for itself although the PSD file only offers the fuselage section parts A, B and C. As far as my knowledge goes, there’s no way to add when needed, a dedicated painting for the wings and engine cowlings, the latter needed in particular for the different engines used on the -61, -63 and the -71 models. Let me first start highlighting the X-Plane 11 DC-8 manual. An informative manual, nicely organized and dedicated to X-Plane 11 which sounds logic to you and me, but isn’t always the case with other developers. It explains how to install the aircraft – no serial number or activation needed – and the necessary settings and animations to make/are included. Sections that are included are for example changing the co-pilots gender, weight and balance with fuel, and how to view preset positions. Personally, with the 3D cockpit available, I think that these preset views aren’t so much of interest since you can move to every position angle/view. And finally, the aircraft panel description and thus “what is what” is briefly highlighted. By the way; before I forget it …. the installation is straightforward. Just unzip the package and install all the aircraft folders in the X-Plane 11 Aircraft folder. Ho, hold on … there’s no need to install the “Manuals and Addons” folder too! 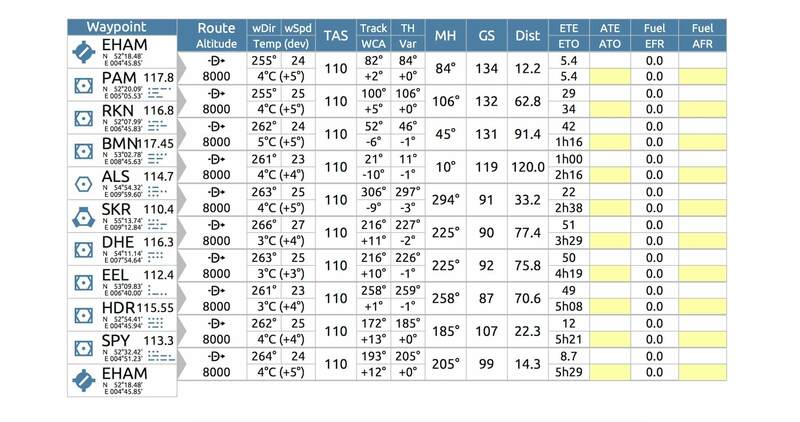 The other 4 files (Douglas DC-8_checklists_COLD and DARK, Douglas DC-8_checklists_ENGINES_RUNNING, Douglas DC-8_flight profile and the Douglas DC-8_landing speeds chart) are actually part of the Acrobat file. The checklist files speak for themselves as well as the landing speed graphic file. The flight profile file offers a description on how to use the -71 model on a typical flight. And finally, the COPILOTS folder. You’re able to change the gender of the copilot. The user manual tells you all about it how to do this. It can also be found on page 6 of the Acrobat manual. Time for a Walk-Around check? 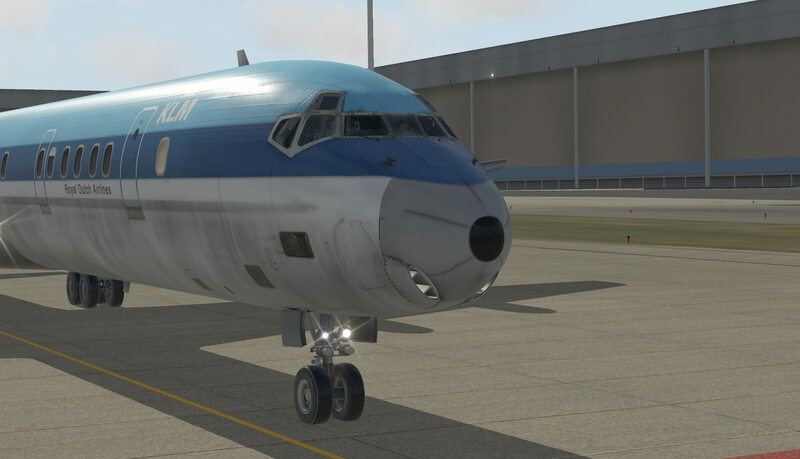 Yes, I think it’s time to do a walk-around inspection on the DC-8-63 Series with KLM Royal Dutch Airlines livery. Logically, I’m Dutch, and seen these when I was young, coming and going from Schiphol Amsterdam International Airport and I’ve even seen them in one of the many KLM hangars. 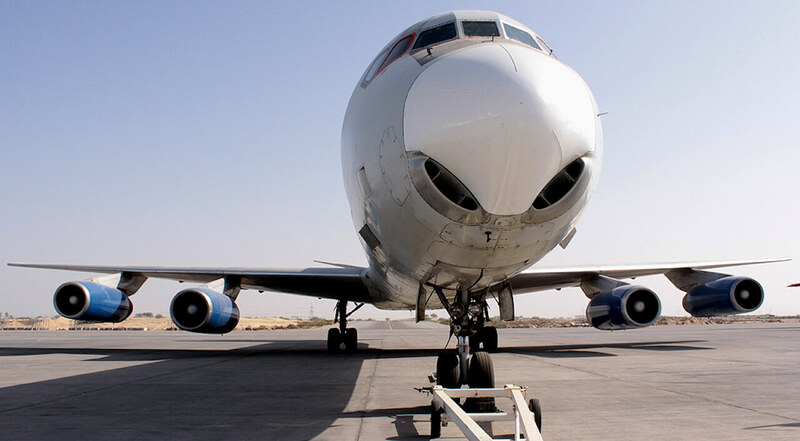 My first impression of the modeled DC-8-63 comes is a wow factor. The modeled aircraft looks and feels like a real Douglas DC-8 which is great news. Will it stay like this when I do my close-up inspection? Let’s find that out. 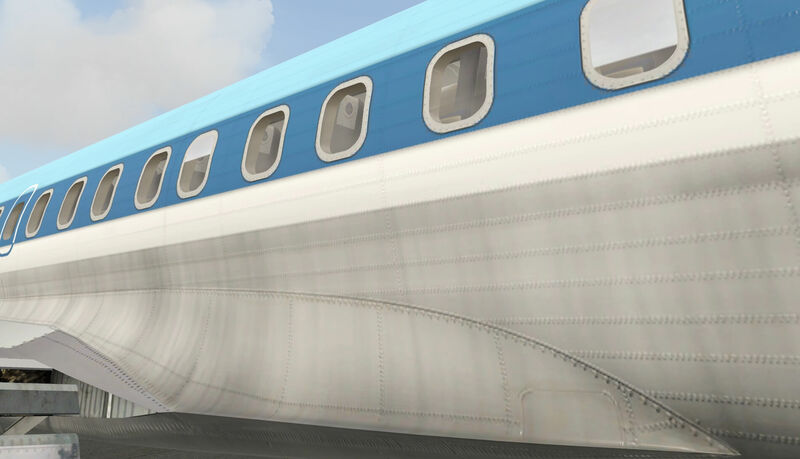 The aircraft textures are each 2K, and it must be said that the fuselage is divided into 3 parts. What mentioned before, the paintkit only comes with fuselage texture files and no texture files for the wing and engines. 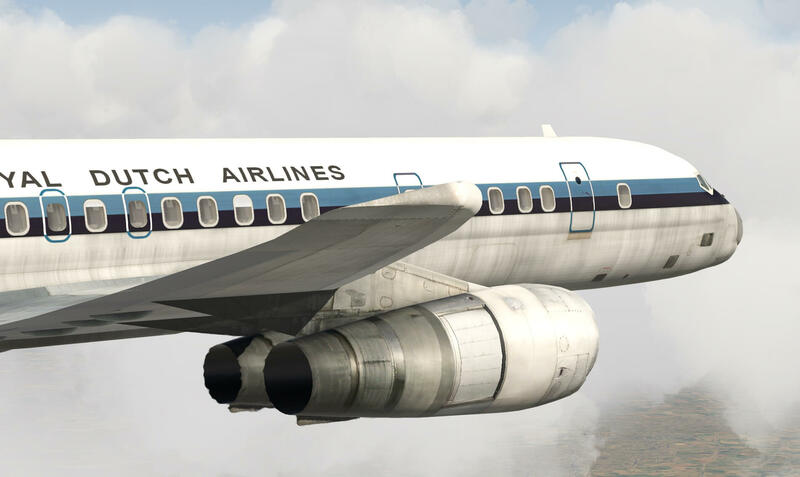 This means that the modeled DC-8’s aircraft have no aircraft registration on the wings which they had in the old days and no decals (engine manufacture sticker) or whatever on the engines. 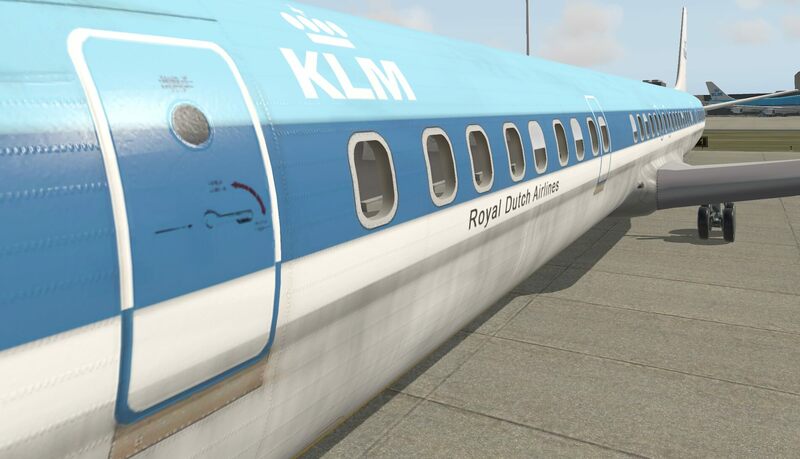 This feels weird since this is something that I miss on the modeled KLM aircraft. Looking to the following real photos it seems to me that the LH bottom wing does have the aircraft registration on it. Looking closely to the engine photo, I also spot on the engine nose cowling a decal of Pratt & Whitney which isn’t available on the modeled aircraft. I have to admit that it depends which registration the aircraft had, and remember, when I’m talking/comparing it with KLM liveries. 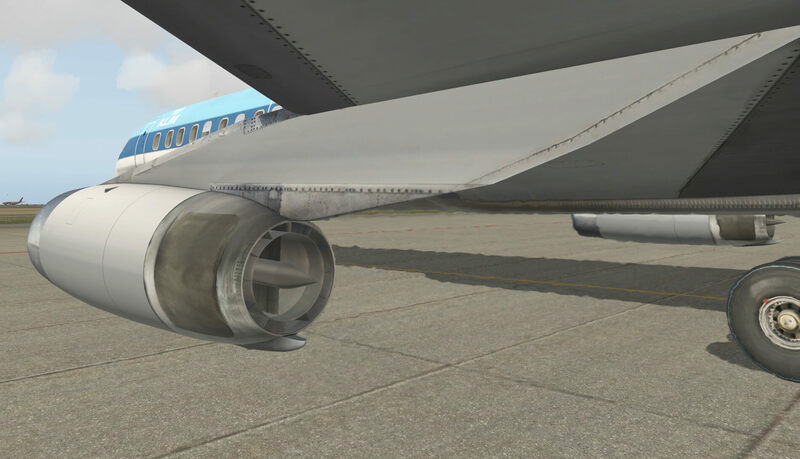 Although these tiny details have nothing to do with the well-modeled DC-8, it would be great when an updated paintkit would include wing and engine “psd” files too. Another thing I noticed while walking around the engines was the fan in front of the JT3D engines. 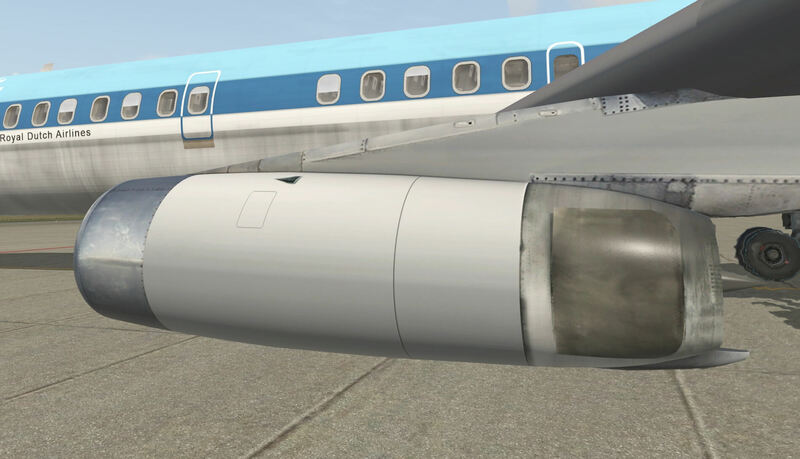 I had something of ….. “this isn’t correct, the engine inlets should have IGVs (Inlet Guide Vanes) at the engine inlet. Time to investigate …. and it turned out that I was wrong. The early JT3 had indeed IGVs at the inlet, but the modified JT3D had a 2-stage fan, a 6-stage IP (Intermediate Pressure) and a 7-stage HP (High Pressure) compressor. For the -71 models the aircraft had upgrade CFM engines which are modern hi-bypass engines with a fan, so that’s a total different designed engine. Pratt & Whitney began development its first production turbofan – the JT3D – during the late 1950s. It was a low-bypass-ratio engine built around the J57’s service-proven core. The JT3 made its first flight on a Boeing 707-120 aircraft on June 22, 1960. Shortly thereafter, McDonnell Douglas selected it for versions of the DC-8. The military version of the JT3D—the TF33—powered the first flight of the Air Force’s B-52H Stratofortress on March 6, 1961. The Air Force also used it for transports such as the Lockheed C-141 Starlifter and Boeing C-135B Stratolifter. In 1973, the Air Force selected a TF33 model for its E3A Airborne Warning and Control System (AWACS) airplane manufactured by Boeing. 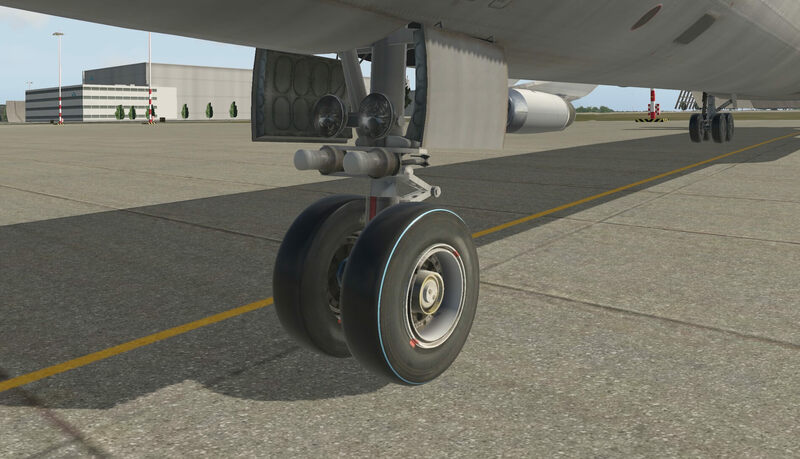 While walking around, starting at the nose of the aircraft, I noticed that the wheels have no profile at all. Today’s aircraft or at least as long as I’ve worked in the aviation, tires always have a profile, so is it correct that these DC-8 models don’t had any profiles on it? Let’s check that out too! 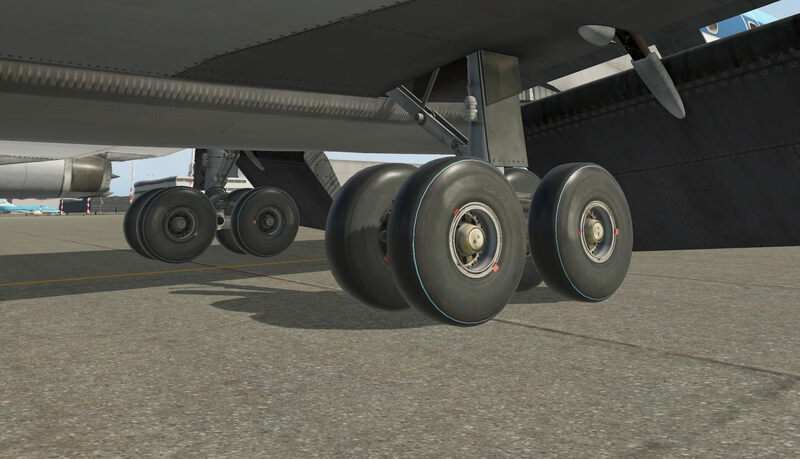 On the following two photos, you can see that these DC-80-60 Series have profiles tires, so hopefully this is something that can be implemented in a future update of the modeled DC-8 aircraft. It all looks so far OK. Oh yes, the small issues I found so far aren’t a big deal. Perhaps you own the aircraft already and never noticed this or you’ve seen it and left it as it is. That’s it also for me! It’s not a problem, but I hope that future updates will include a complete paint kit or that modifications can be made to the model in respect to what I’ve seen. One last item to highlight and that are the decals or text on the fuselage. They are blurry. I can’t read anything on what’s on the, for example passenger doors. But that’s the same with certain panels on the fuselage. I’ve got an idea what it should be, but you can’t read it. Different methods are used to add text or decals to an aircraft, but one thing is thru; it is possible to have a better and sharper text or decals. From the fuselage, and engine pylons, I’m walking along the wing leading edge to the wingtip. The wing looks elegant, has a massive leading section with no slats and/or Krueger flaps. It seems that the wing shape is well done, but I miss all the static dischargers at the end of the wings, trailing edges of the ailerons and elevators. The rudder has static dischargers mounted at the trailing edge, but I hardly believe all other trailing edges have no static dischargers by default. 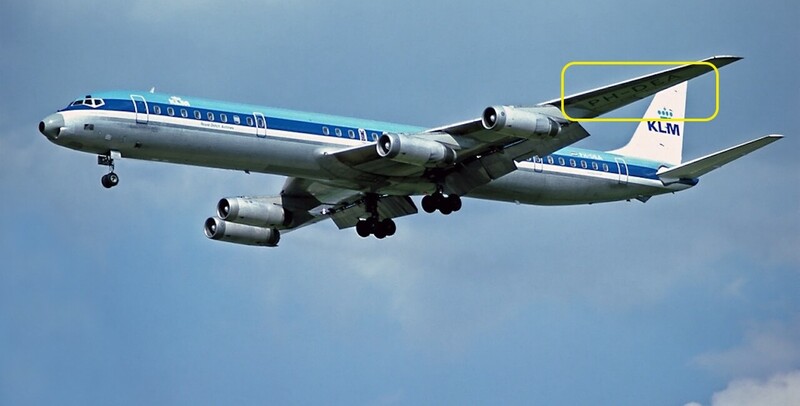 Finding good close-up photos of the DC-8 isn’t easy, but static dischargers are common on the trailing edges of flight controls and wingtips. Knowing myself, I needed to find it out. Via the Internet I found the DC-8 American International Airways Flight Operations Manual Section Normal Operating Procedures pages 2-20 and up. And yes, found that for example at the wingtip the pilots need to check the presence of the static dischargers and so on. 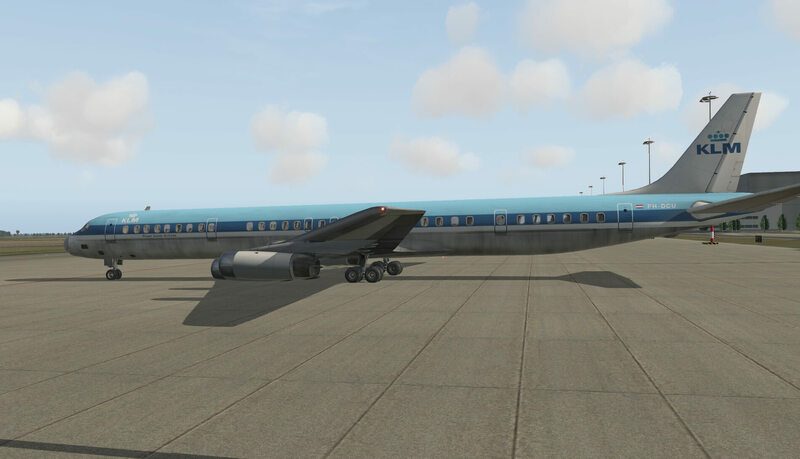 Overall a nice and good-looking DC-8-63 although I would appreciate, not only for me, but for all those simmers who bought this aircraft or those who are interested in it, when the developer can try to solve some of the issues I highlighted then I will be even more happy. To visualize additional equipment or features, you won’t find a popup window or screen icon. 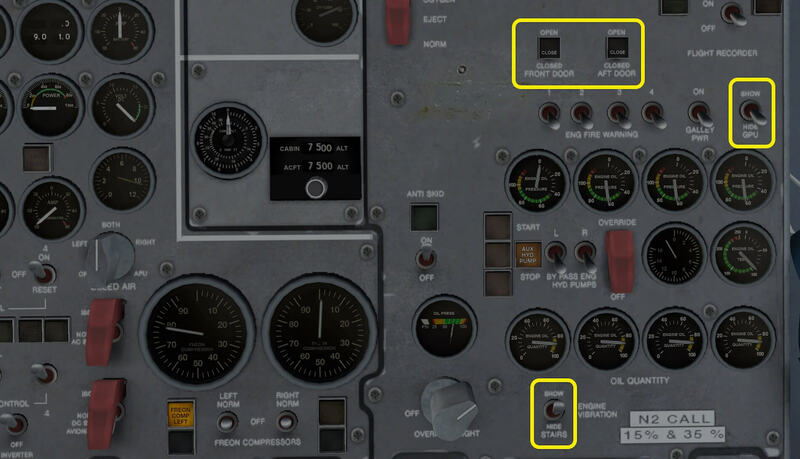 Instead, to show/hide for example the GPU (Ground Power Unit), you need to select on the FE (Flight Engineers) panel right-hand upper section, the GPU switch to HIDE or SHOW. Don’t forget to select the BAT switch from OFF to EXT PWR else the GPU receptacle isn’t connected to the aircraft and lies on the ground! At the same FE panel section, you’ll also find switches to control the FRONT and AFT passenger doors. That are, by the way, the only doors that are simulated in the -61, -63 and -71 models. The door stairs are controlled via a separate switch on the FE panel. The STAIR switch is situated below the OIL QUANTITY indicators near the N2 CALL decal on the FE panel. The reason I highlight this is because the current manual suggests via a note that the animation of the doors includes the animation of the corresponding stair car which turned out that this isn’t the case. What other features are implemented? 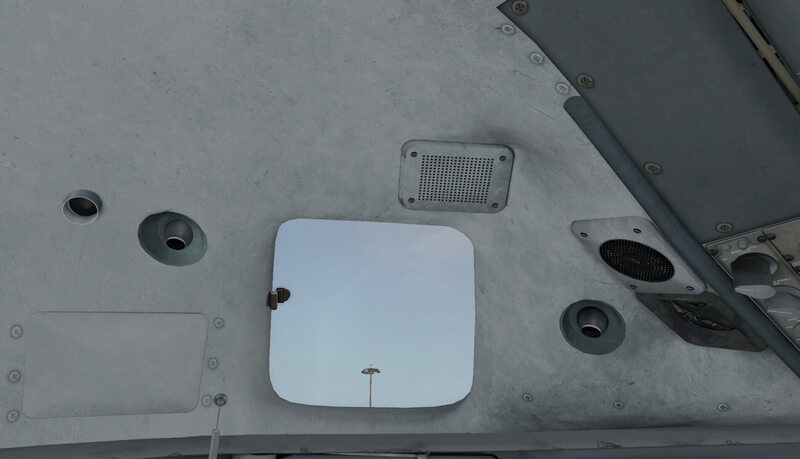 As far as I can see, no other doors or panels are simulated except then the upper deck cargo door of the -71F model. For the 3D cockpit; I couldn’t find any other simulations like movable arm rests, movable sliding window or functional cockpit door. That’s a logical title …. that’s a logical step while I’m already in the cockpit, this to check out the modeled 3D cockpit. 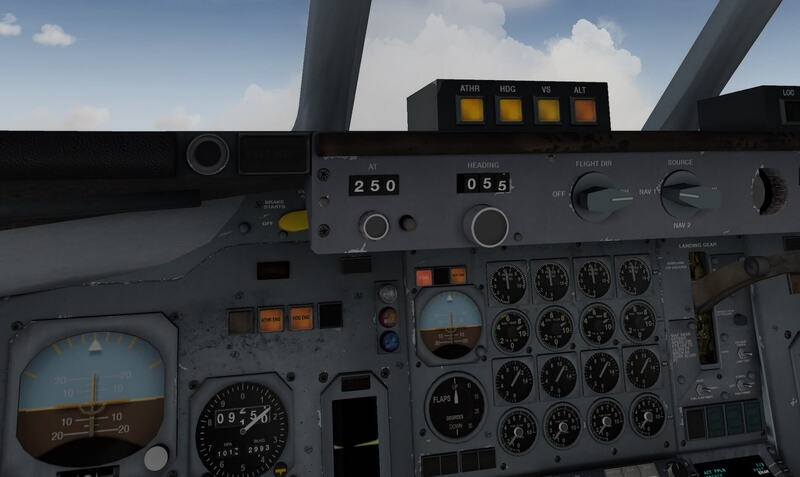 With so many DC-8 cockpit lay-outs over the years, with so many system and navigation configurations, it’s difficult to go for “a” cockpit lay-out. 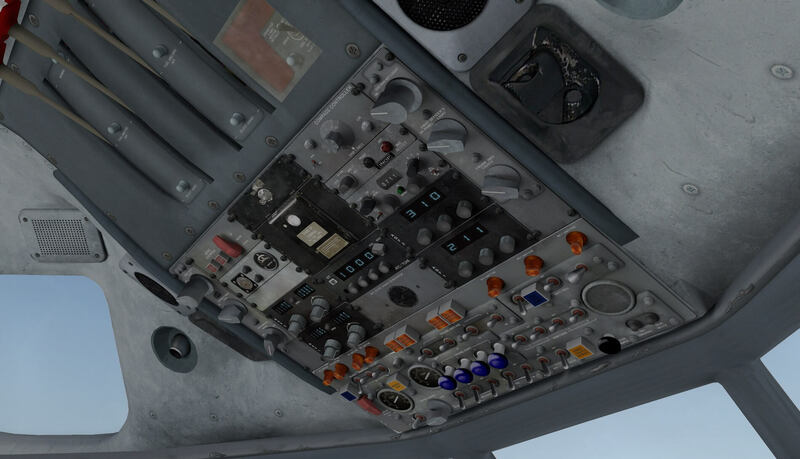 The team has chosen for this lay-out as well as the presence of the navigation equipment like the INS CDU in combination with the default X-Plane 11 FMS (M)CDU or, for the -71 models, two FMS (M)CDUs. When you’re used to work with the default FMS (M)CDUs (with popup), you’re aware that a flight plan can have the “fms” extension. The installed INS on the left-hand side of the pedestal in only available with the -61 and -63 models and not unimportant, it only works when you’ve installed the CIVA INS add-on. Without this CIVA INS add-on, it does give you the feeling that you can operate the in-situ INS CDU, but although the mouse pointer changes and simulates you can operate the CDU selectors and buttons, it doesn’t do anything. Anyway, let’s first look around in the 3D cockpit. My first impression is that a lot of time and effort is put into this cockpit. 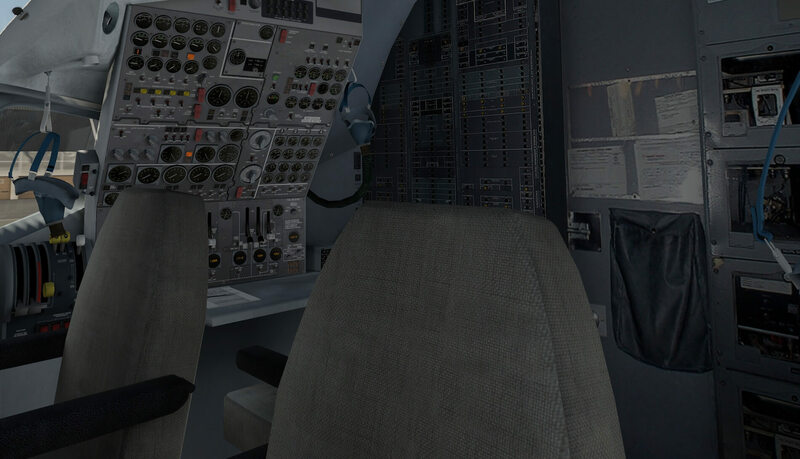 Since it’s an old-fashioned aircraft and difficult to find a real DC-8, it’s not easy to create this and if the developer prefers this, using photos to make cockpit textures of it. If this is the wish of the modeler to give it an as real as it gets look and feel, then high resolution/quality photo material are needed and with such an old aircraft, that’s not always easy. But when the modeler/developer has great PhotoShop skills in adding to panel textures weathering and/or scratches, then the end result could be also great. Most of the panels I see are made old with scratches, dents and weathering which is I think as real as it gets. What said, it’s an old aircraft and I hardly believe that you’ll find brand new cockpits with no scratches, no weathering etc., so I like the way it looks like. The main instrument panel, pedestal, side- and wall panels look OK to me as well as the FE (Flight Engineers) panel. 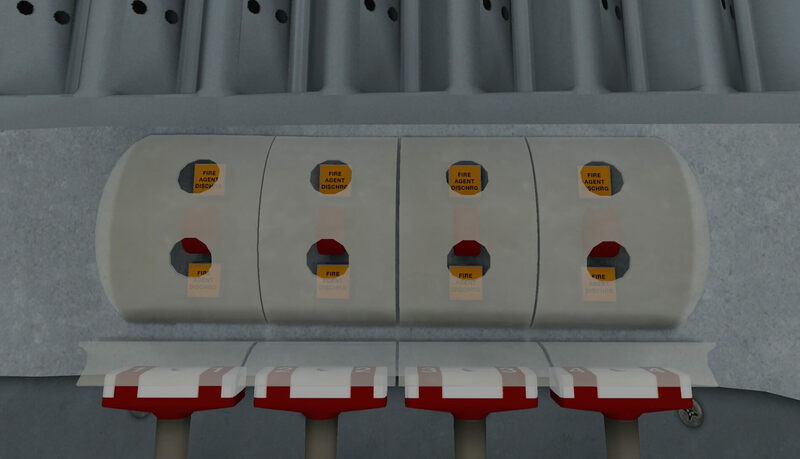 For those simmers who know the Rotate MD80 Series, they will see a lot of similarities in the sub panels and then I main the way panels are organized. Logically, the DC-9 and later the Super DC-9-80 Series, have panels more or less identical to those in the DC-8. I won’t compare this modeled 3D cockpit with other add-on X-Plane 11 aircraft cockpits. I think it’s not fair and doesn’t bring me or the developer anything. 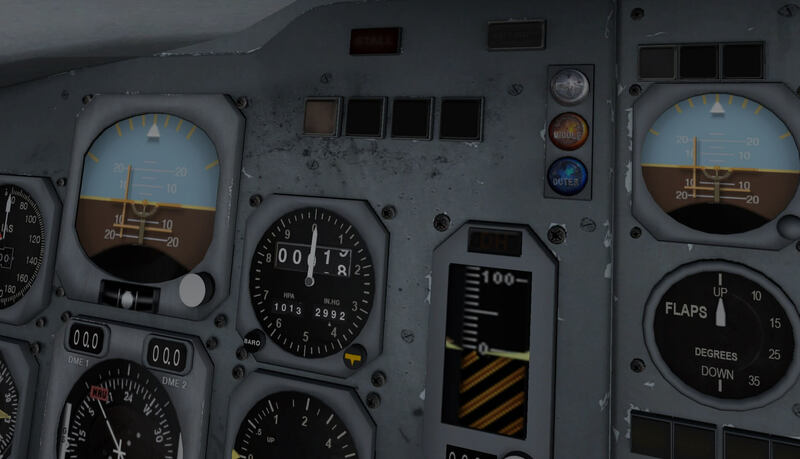 What’s important to me is what I see and feel with this modeled DC-8 cockpit! Most of the text on the panels is clearly readable, although some text is slightly fussy, but still readable. When, for example, looking to the center instrument panel “engine instruments”, you’ll see all different type of instruments. I needed to double check this with photos and indeed, during these days, designers/vendors weren’t so accurate in creating/having the same type of instruments on the same sub-panel. Scanning along the main- and center instrument panels, you can clearly see the 3D effect from the indicators, lights, bulbs, and even from the screws. That the panel looks a mesh, everywhere you find something mounted, not always in a logical order, is all normal. This is however not applicable for the basic T arrangement of the analog flight instruments on both the captains and co-pilots panel. A good example of putting somewhere in the cockpit on a weird place are the annunciator Auto Pilot/Flight Director panels, mounted on top of the glareshield. Weird …… it’s the reality. I did found some cockpit photos with this! It must be said that not all switches, selectors and lights are functional. On the overhead panel, I wasn’t able to control switches on the INS panel. The same applies for the NAV1, NAV2, ADF1, ADF2 panels. On the GPWS sub-panel I couldn’t move the red guard although I did hear a clicking sound when using the mouse. I wasn’t able to simulate a STALL test since the switch wasn’t controllable. That said, just keep in mind with this X-Plane 11 DC-8 package not all works. Ho ho …. hold on, isn’t it weird that you’re aren’t able to select any frequency on the NAV1, NAV2, ADF1, ADF2 panels? Yes, that’s weird, so I applied electrical power to the aircraft and guess what, they work with electrical power applied. Although I understand the philosophy behind it, without electrical power I do see the selected frequencies so why I’m not able to control these? Personally, I would expect that with a dark and cold cockpit, the NAV, ADF and COM panels don’t show the digital indications till you apply electrical power unless the indications are mechanical. In case the panels are simulating mechanical characters, then you should be able to control the frequencies without electrical power. 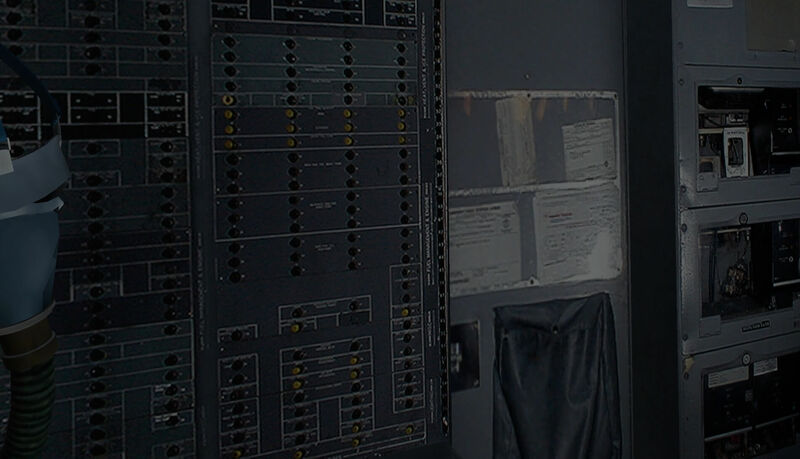 But …… for some reason I was without electrical power able to control the squawk code on the ATC/TCAS control panel. This is weird since this panel is of the same design as the other COMM/NAV panels? There’s however a critical note I have and that deals with the photo real back wall in the cockpit near the flight engineer. The textures consist of circuit breaker panels, equipment panels and the cockpit entrance door which isn’t functional by the way. 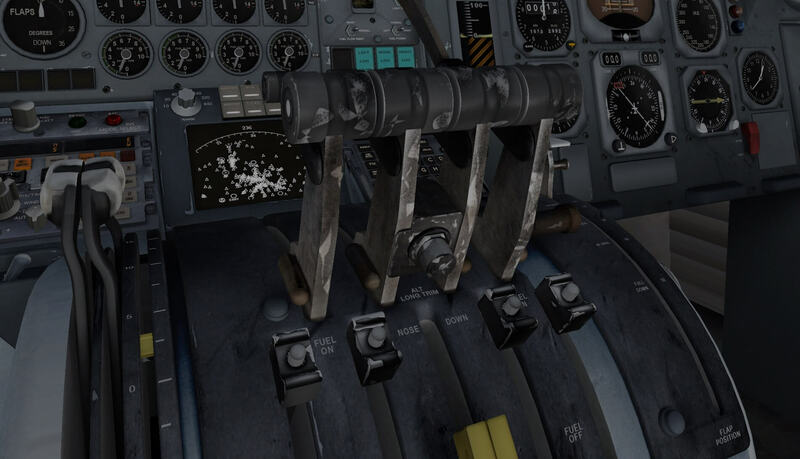 I’m aware that this is just to fill up the modeled 3D cockpit, but the bad quality of the photos is a pity that they are used/implemented. 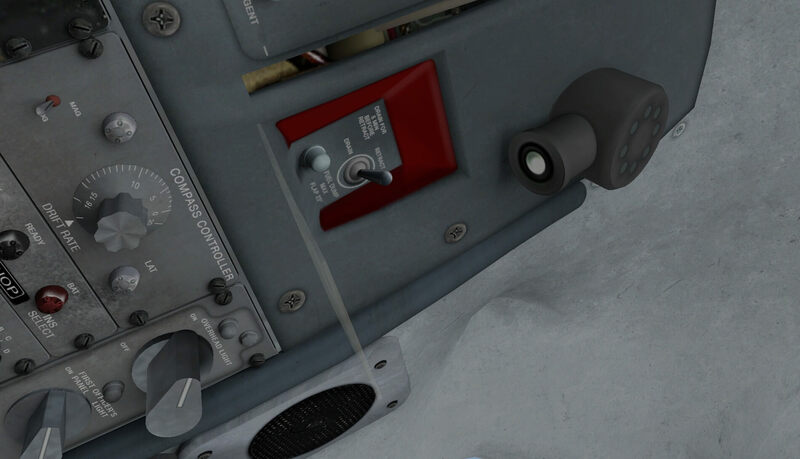 Further on I must say that many tiny things in the cockpit have been modeled like for example the windshield temperature sensors, the old-fashioned oxygen masks with clips, sliding window mechanism (although not animated), air outlets etc. Overall satisfied. 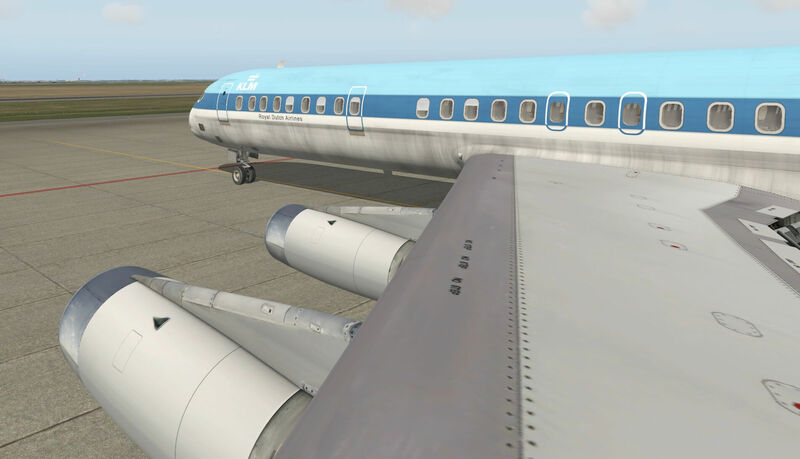 For this test flight I will use the DC-8-61 model with the old KLM Royal Dutch Airlines livery. 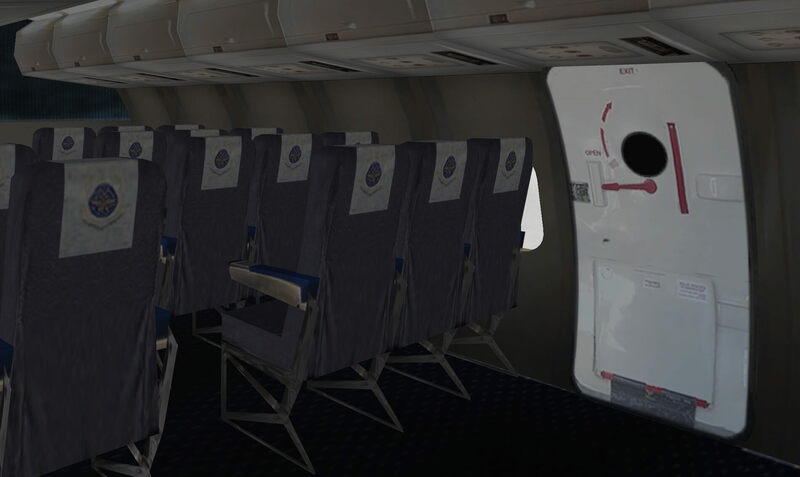 It will be a test flight that includes more or less everything that can be used in combination with the Auto Pilot and some pieces where I test the manual flight behavior of the modeled DC-8. 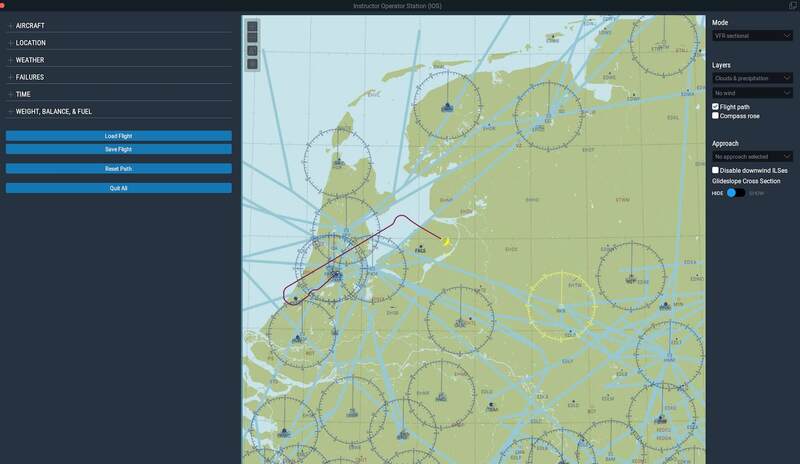 I’ve created with SkyVector a flight plan that consist of VOR/DME waypoints. 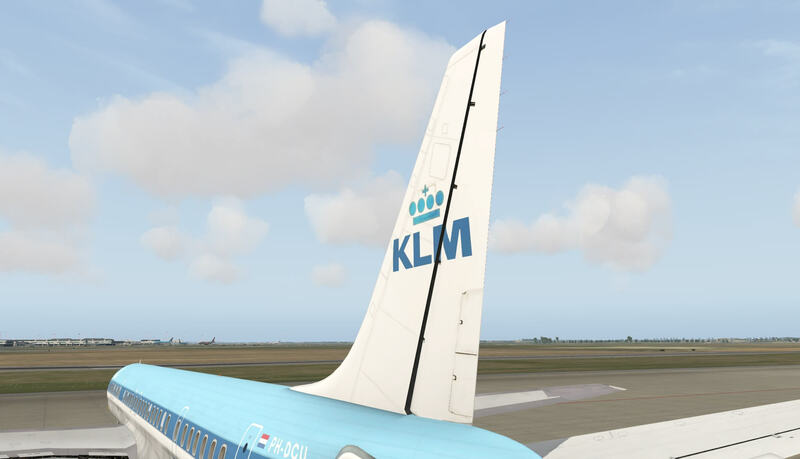 The flight starts at EHAM (Schiphol Amsterdam International Airport) and ends again at EHAM. As just said, in-between I’ve added only VOR/DME stations, but it was also possible to add waypoints because I’m using for this flight the build in default X-Plane 11 FMS MCDU. After I’ve updated the default X-Plane AIRAC and placed my EHAMEHAM.fms flight plan file into the X-Plane output folder, it’s time to start. The manuals folder comes with a check list for a cold and dark situation or one with engine running. Since this is my first attempt, I decided to have the engines already up and running. Next step is to check if my AIRAC is OK and if I can find the flight plan. Then I need to check what to do before I start taxiing. 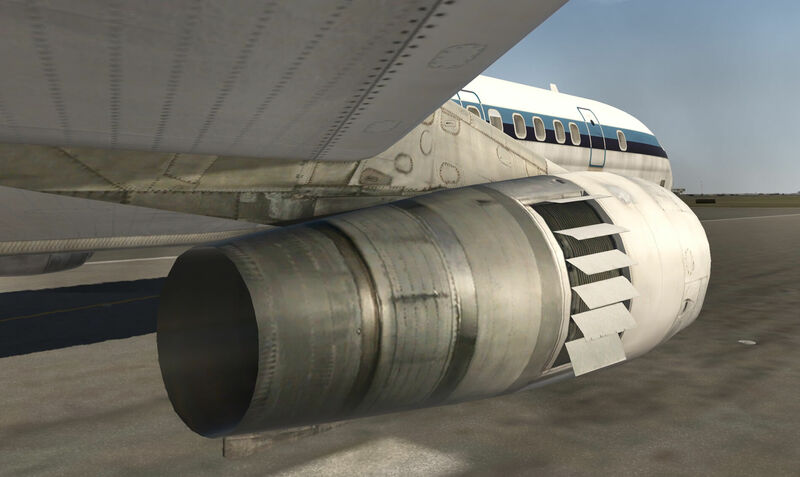 For this, I open Rich Format Text file “Douglas DC-8_checklists_ENGINES_RUNNING” and follow the necessary steps to perform. By the way, this file is also included in the Acrobat document so when you have printed the whole Acrobat manual, you have these RFT contents too. The only thing I noticed on my Mac are the very slow increments for the IAS (Indicated Air Speed) and altitude knobs. Moving the mouse from one side to the other side only gives me a small amount of digit changes. Very annoying when knowing that you need to set an altitude change from 3000 to 9000 feet! This is not the case with the AT (IAS), HDG and V/S. Those are easy to adjust with the mouse. Taxiing from the parked location APRON B51, I taxi straight to runway 24. 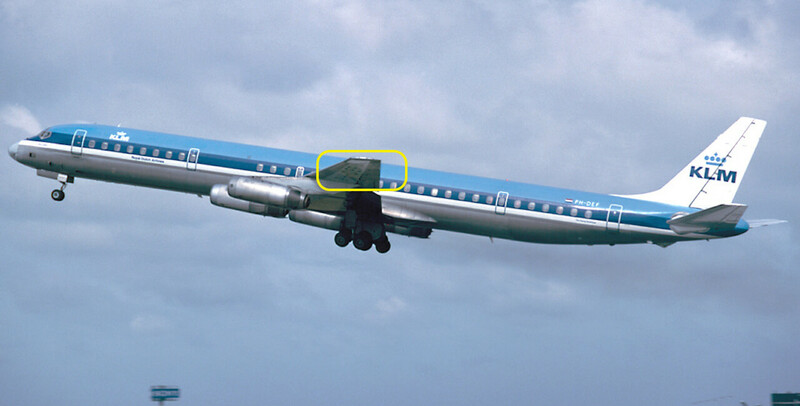 Keep in mind that the DC-8 is long and although the cockpit is more or less positioned above the NLG (Nose Landing Gear), making ground turns means that the MLGs (Main Landing Gears) quickly miss the taxi center line. Oops, almost forgotten to tell you. 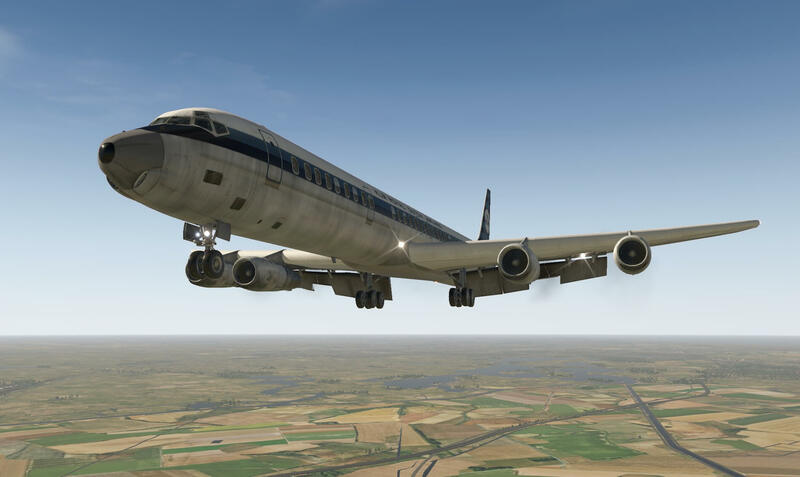 The modeled DC-8 uses the default build-in X-Plane 11 fuel and C.G. popup window. The provided manual explains more how to use this in relation to the modeled DC-8 series. As said before, taxiing isn’t difficult and the aircraft responds to any movement I make. 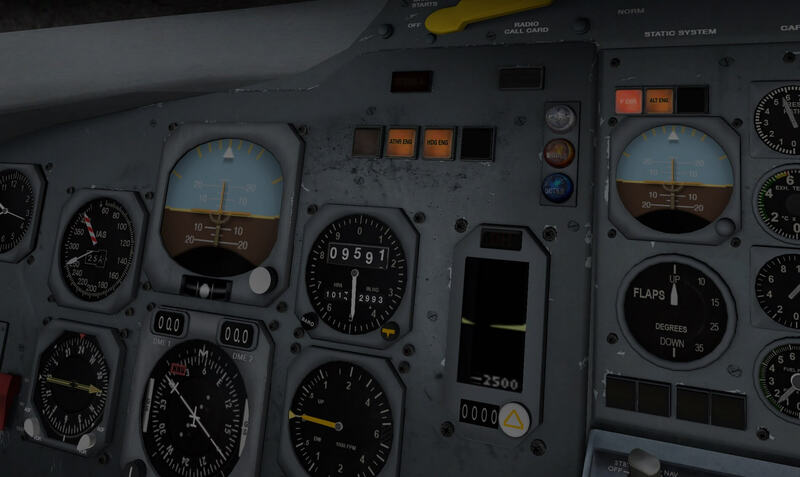 I’ve made the necessary preparations, remember, a checklist with engines running and cold and dark are included as RTF files. Sorry, no option included that could give you a popup window checklist as you sometimes see with other developers. After takeoff, I decide to leave the AP OFF and fly only by hand. That said, I don’t switch the AP, but trim the aircraft first, then try to get the right feeling how this aircraft behaves. If it flies as real as it gets is something I can’t judge since I’ve never flown the DC-8 nor being on-board as a passenger. 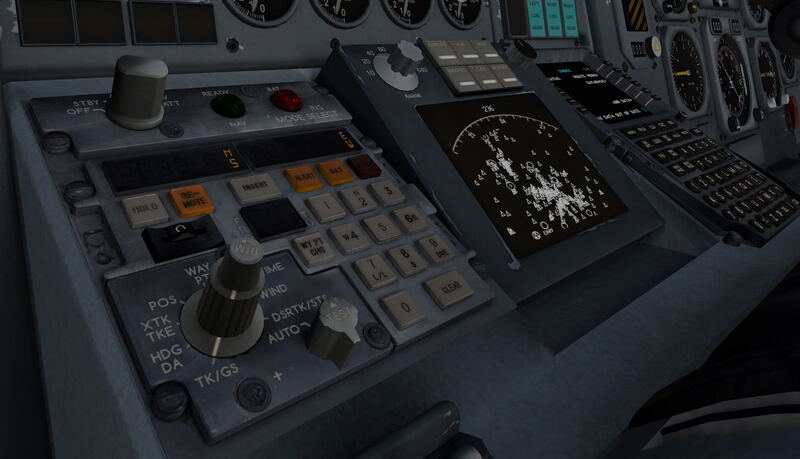 According to Mike, the flight characteristics have been tested by retired DC-8 pilots so the only thing I can do is to accept that they find it OK.
After some time and felt how the modeled DC-8 flies, it’s time to set the AP. On the AP panel at the glareshield, you’ve got a FLIGHT DIRECTOR selector switch which has to be set to ON and a source selector switch can be set to either NAV1, NAV2 or FMS. I could use FMS since I have a flight plan loaded, but I first want to see how it controls with the basic AP modes active (HDG, V/S and ALT). I’m sure you’re aware of this, but just in case, when you select HDG as active ROLL mode, please set your HDG bug first at the HDG you’re flying. Next, I set a ALT of 9500 with a V/S of 1500 feet/min. This is done by clicking the two buttons on the small panels on top of the glareshield. Once leveled off at FL095, the VS light extinguishes, and the ALT light turns from amber to yellow. And finally, I do the same for the ATHR (Auto Thrust) mode. Not sure if AUTO THROTTLE or AUTO THRUST where real features at that time, but Mike has implemented this. Click the ATHR on the popup panel on the glareshield, button turns yellow, assumed that you’ve set the right speed on the AT indicator. For this flight, I stay at this lower altitude, but else you can switch between IAS and Mach with the button next of the speed knob. While the captain stays in the cockpit, I find myself in the cabin. 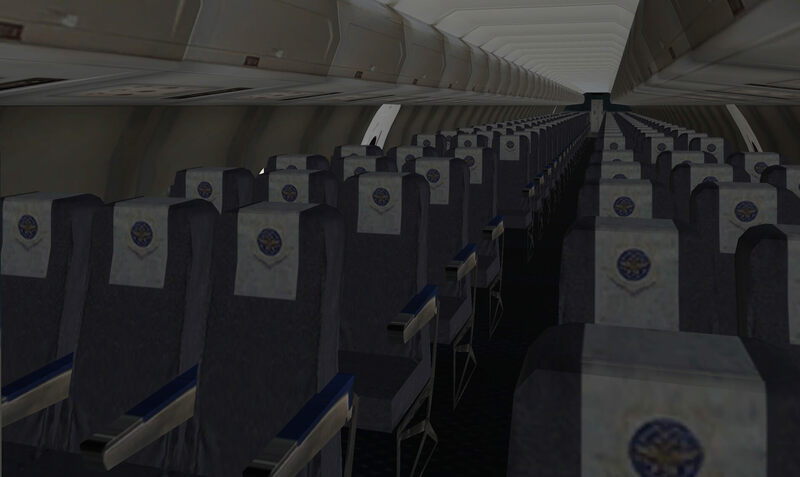 The modeled DC-8 does have a virtual cabin, but it’s not the most elegant one. The overall look is OK, but I find it a bit too dark and the sidewall panels are not white or creamy colored. It could be that this is as it was in real, but looking to a passenger door, which has a white cover, it feels different. Not that this is so important since there are simmers who have no interest in a virtual cabin at all while some love a virtual cabin. For me, it’s important that I’ve highlighted the virtual cabin in the review and then it’s up to you what you prefer. For your convenience, find a couple of cabin screenshots. I’m back in the cockpit. I’ve decided, that’s the only way to figure out if all works, to descent to FL090. To manage this, select a V/S speed of your wish, set of course the new altitude on the AP panel and click the V/S button. This will extinguish the yellow light in the ALT button which is replaced by amber while the V/S button turns yellow. Not unimportant, underneath the glareshield above the standby horizon, the ALT ENG (engaged) light extinguishes while the VERT ENG illuminates. Next, it’s time to try a NAV mode thus I select a NAV 1 frequency on the overhead panel. Not difficult, but worth to highlight. Once a NAV 1 active frequency is set, turn the HSI (Horizontal Situation Indicator) till the deviation needle is in line and that the arrow or pointer points towards the station. Then deselect the HDG mode and click the LOC button on the popup panel on the right side of the glareshield. If I want and if you want, you can set a new frequency in the NAV 1 or you decide to use NAV 2. Let’s check that out. I set in NAV 2 a new frequency, change the source mode selector on the AP panel to NAV 2 and let’s see what happens. 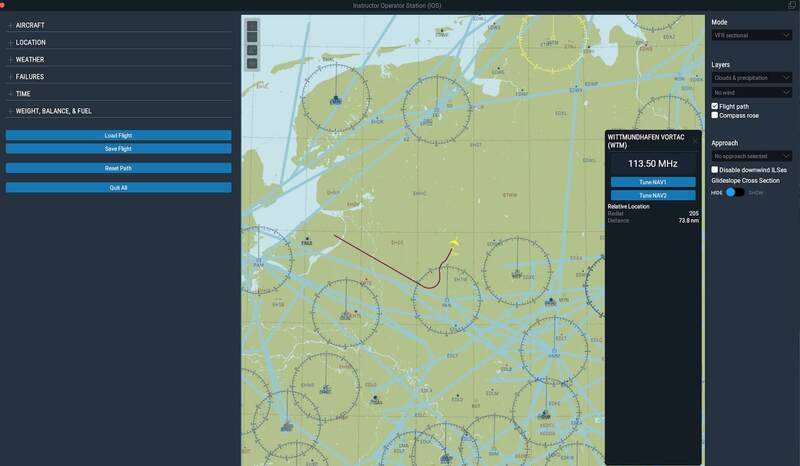 And finally, flying with the build in FMS MCDU thus using the flight plan. Instead of having the source selector on the AP panel in NAV 1 or NAV 2, I select FMS and not to forget to activate the LOC button on the right-hand panel on the glareshield thus having a yellow light. 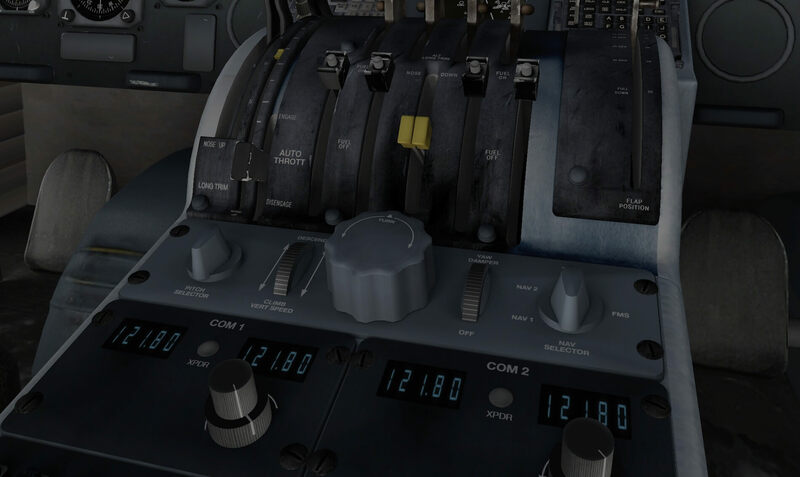 When you have the popup FMS MCDU in view and selected also from the X-Plane menu Flight | Show Map or Show IOS, you can see the progress of the flight visually on your map and via the LEGS button on the FMS MCDU on the MCDU. Active flight leg pink. Since the package doesn’t come with a tutorial, you need to create yourself although it is thru that the modeled DC-8 isn’t difficult to fly. How real this is, said before, I don’t know. I could be wrong while monitoring the DC-8 flight behavior, but I think the aircraft uses the default X-Plane 11 Auto Pilot. That’s good news and for some bad news since the AP is then not a dedicated DC-8 AP. On the other hand, what I’ve seen during this test flight is that it does what it has to do and that’s good news. Don’t forget that it’s not a A320, A330, 777 or any other sophisticated aircraft. It was an old-fashioned aircraft and it stays like that and what’s modeled feels good. Most likely it was during those days analogue controlled and monitored AP. Personally, I had found it a good idea when the basic AP panel on the pedestal was also simulated. Now it’s there, but it doesn’t do anything. Oh yes, you can say “but on the glareshield it’s doing what it supposed to do” and yes, that’s true, but it was a “one step more towards realism” when that pedestal control was also simulated/modeled. Anyway, as far as I’ve seen, the DC-8 AP does what you may expect from it. 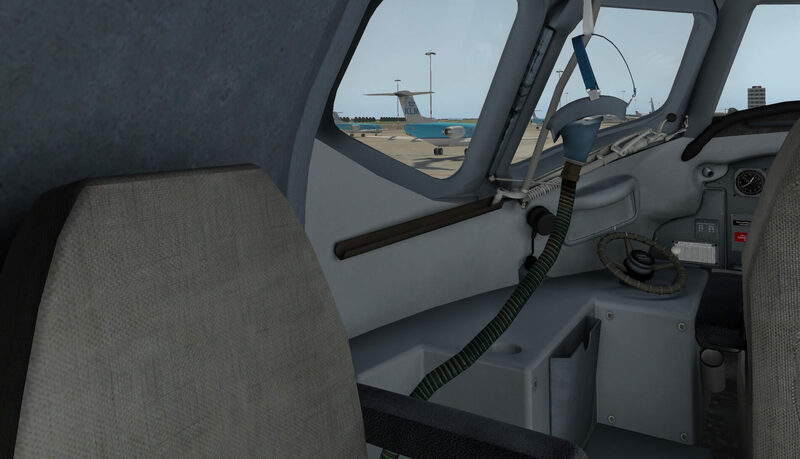 That I used the build-in default FMS MCDU is OK. With the new X-Plane 11, the FMS MCDU has been updated and improved. The provided manual highlights also the option of using the X-FMC freeware add-on. Up to you if you prefer that one. But when you prefer to use the CIVA INSD add-on, then I would have hoped – perhaps with a package update – that a tutorial with that add-on is added and explained how to use the CIVA INS. Those who only fly with FMS MCDU’s will get it difficult with the CIVA INS! 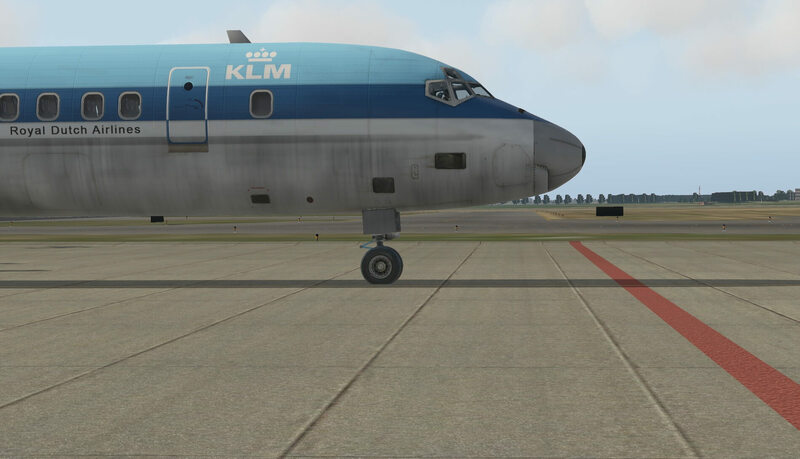 At the end of my flight, I decided to make a landing on runway 06 EHAM. It has a frequency of 110.55, so after that’s set, and flying towards the runway, the AP does it again. For this, I’ve selected both the LOC and G/S buttons on the right-hand popup panel which turn yellow. The only thing I need to do for the approach and landing is selecting speeds on the AP panel or disconnect the AT and move the throttles manually and don’t forget to extend the flaps and landing gear. 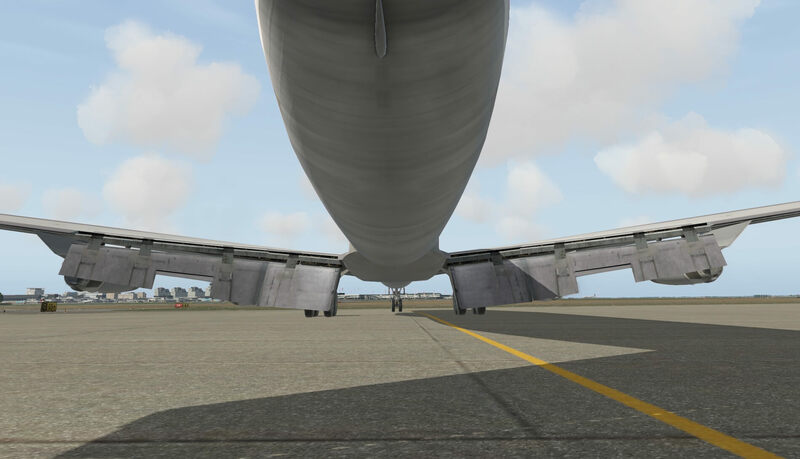 When you and I decide to do a manual landing my advice is to trim the aircraft first else with an untrimmed DC-8 it’s a difficult way to handle. I did see this before, but I think it’s important to highlight. It’s the way the right-hand altitude digit behaves. When altitude is increasing/decreasing, this digit has a weird behavior. It looks like, I could be wrong, that this digit is running the other way as the other digits. I don’t know how it looks in real, but when you see it, it looks weird. Oops, back to my manual landing. 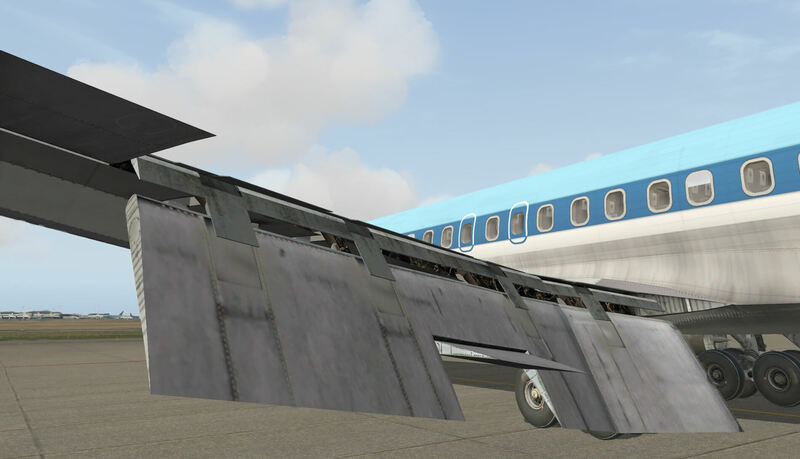 When selecting the flaps, be aware that the last flap selecting, the maneuverability of the DC-8 reduces, so be aware that you’re on the localizer before selecting FULL flaps. 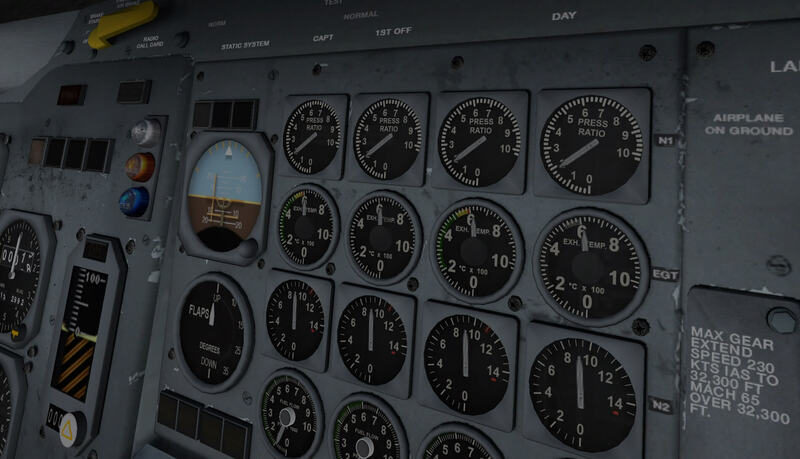 You need to practice a bit with the DC-8, but you will succeed. I did it, so, you should be able too! By the way, the AP doesn’t come with a FLARE or ROLL OUT mode, so you need to disconnect the AP at or before the final approach flight phase. I did had other things in mind doing this test flight, but it turned out that I tried more then expected. This full test flight I think covered every mode except for the BC (Back Course). Overall a nice aircraft. It looks on the outside good, the 3D cockpit is nice and it flies as expected. Does this mean everything is OK, no comments or whatsoever? Check that out in my summary. What other bits and pieces are important to highlight? I’m satisfied with the frame rates. 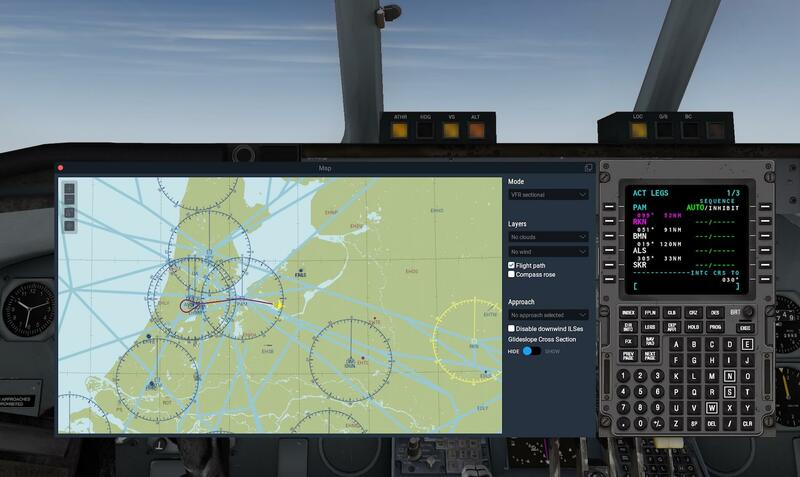 It can range from 25 to far past the 40, but that depends on your machine, perhaps even the OS (Operating System), your monitor resolution, X-Plane 11 settings, used add-on airports and/or other sky enhancement products and so on. I could listen to old and new YouTube movies to figure out if the provided DC-8 sound is authentic or not. What I do know is that each DC-8 sound folder has at least 100 MB of sound files, one a bit more then the other. Engine sounds for the -71 Series isn’t so difficult since these engines can be found these days. Not only fitted on -71 types, but also on other aircraft models. The engine sounds that belong to the -61 and -63 series is more difficult. 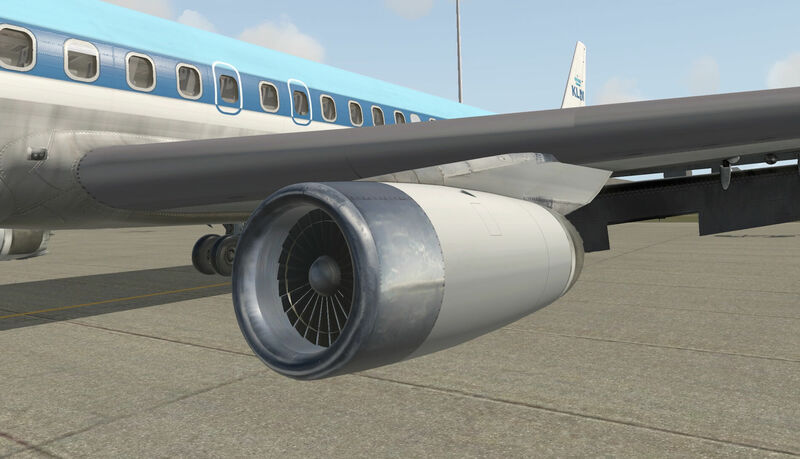 The JT3D engines are old, very old and perhaps somewhere at this globe you’ll still find a DC-8 with these engines, but it will be difficult. That said, I can’t confirm if the included DC-8 sounds are all real. Although I did a flight with the DC-8-61 and a walk-around inspection on the DC-8-63, the other two models – DC-8-71 and DC-8-71F – aren’t really different besides then the engine types and the presence of 2 FMS MCDU’s in the pedestal. That said, the models I used for this review are not behaving much different then the -71 Series models. And at the end, the summary. Was it an easy review? Did it cost me more time then expected? Am I satisfied with the end result? Ok, let us first look what it cost and where to get it? 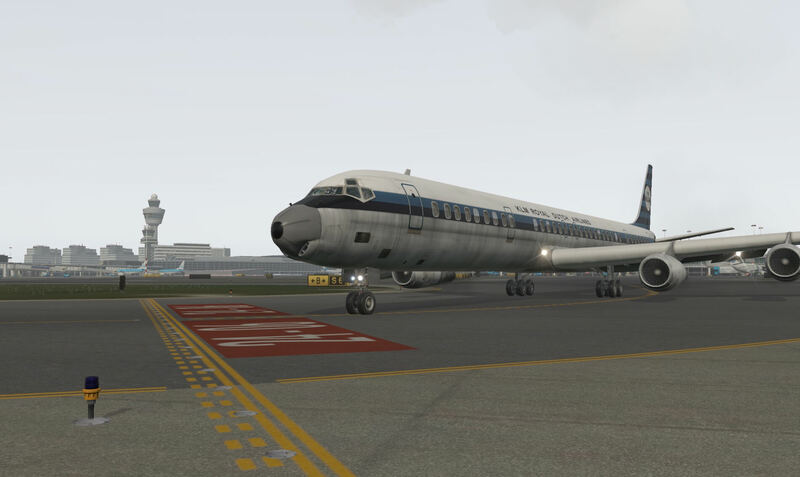 The Wilson DC-8 collection is available via X-Plane.Org. The DC-8 71 XP11 package cost you 35.00 USD while the X-Plane 10 package is only 25.00 USD. As you might know now, the package comes with 4 different DC-8 aircraft types. The package doesn’t include the CIVA INS, so when you’re eager to use this add-on during your -61 and -63 flights, it will cost you another 10.00 USD. And of course, everybody wants to know if it is worth the package price versus what you get? 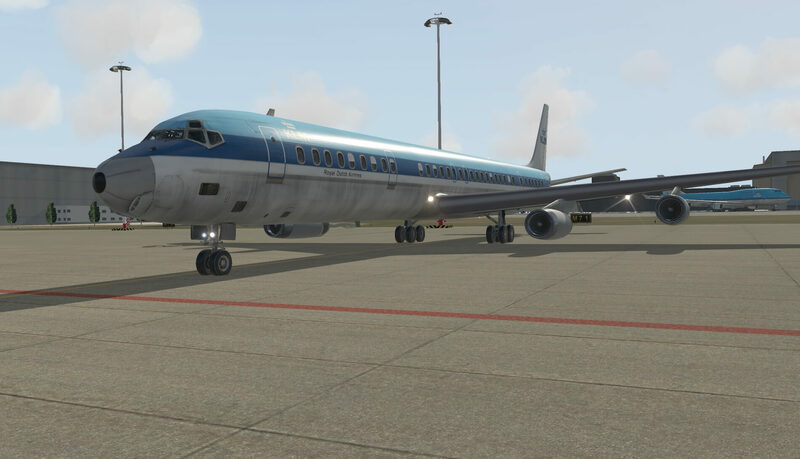 As you’ve noticed yourself, this review doesn’t include xCIVA INS test flight, but once I have a green light from Michael Wilson and Julien, I will provide the community with a review dedicated to the xCIVA INS in combination with the Wilson Classic DC-8 Series for X-plane 11. Although I’ve added in the list the manuals and add-ons, this package has no specific version number nor that the Acrobat manual has a number. This package from Michael Wilson is roughly half the price of SSG, JARDesign, FJS, Rotate and FlightFactor aircraft, but it must be said that the modeled DC-8 has a lower texture quality standard then previous vendors. I pinpointed already during my walk-around check some texture issues. Hopefully that can be improved although once a model is done, I believe it’s not easy to increase e.g. the texture sheet dimension from 2K to 4K or perhaps to provide them both like with the Rotate MD80. Although the 3D cockpit does have nice textures, some improvements near the FE table and back wall would be nice. That not all systems are simulated or at least not all switches and knobs aren’t functional, is something you see with other developers too. That the default X-Plane 11 Auto Pilot is used – hopefully I’m right with this thought – instead of a dedicated own modeled one, is also something you see with other developers. But I would love to see that the basic AP control panel on the pedestal will be simulated too. Now it’s nicely created, but doesn’t do anything! I personally like old-fashioned aircraft, so I like the FJS 737 Classic, FJS 727, the Rotate MD80 and these Michael Wilson DC-8 models. And from a distance the DC-8 looks very realistic! Perhaps a lot and mostly after a week or so, I think “hey, I have forgotten this and that to highlight”, but I think that this review does give you a good idea what I feel, what I’ve seen and what I think of it. Oops, here’s one that pops up … 3D crew members. For the -61 and -63 models: on the left aft corner of the FWD pedestal, just behind the INS CDU and for the -71 models; aft of the FWD pedestal just behind the Flight Plan CDU (you normally would say the radar), you find a switch to show/hide the co-pilot and Flight Engineer. Any further differences with the -60 and -70 series? What I mentioned before, not much, but the ADI is replaced with an EADI (Electronic Attitude Directional Indicator). And yes, you find 2 FMS CDUs in the pedestal. As far as I could figure out in the 3D cockpit, these are the differences. When it comes to the external changes, the -71F freighter has the same FWD and AFT door switches on the FE panel, but this time an upper deck cargo door is included and for the STAIR switch, the same FWD and AFT stairs are placed in position. A couple of containers and boxes are placed on the ground near the upper deck cargo door of the -71F. That said, perhaps Mike will add with a future update also a Hi-Loader for the -71F model. And hopefully also other external features can be implemented like a pushback truck or the ability to control the passenger door stairs individually. Anyway, just wishes! Loved your review. Thank you. Beautiful part of aviation history, well reviewed & a great price !! Hi, thanks you that you liked the review. Part II that deals with the CIVA INS is handing somewhere in the air.